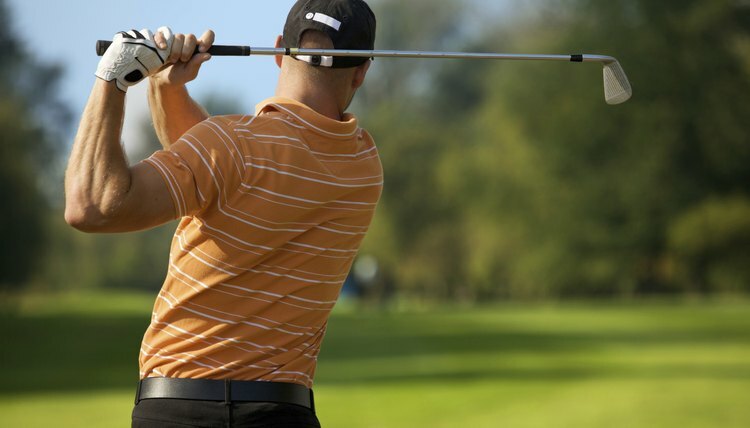 The repetitive swing motion of golf can cause low back pain for many golfers. Unfortunately, due to the consistent rotational movement of the golf swing, golf can be a painful sport. Golfer's back is a common injury that prevents many enthusiasts from enjoying their favorite pastime. One way to prevent or alleviate back pain is to undertake a fitness plan that focuses on stabilizing the muscles of the core and spine that are used in golf. A proper warm-up is a critical part of any golf exercise program. During your warm-up, your muscles increase in temperature and your blood vessels dilate. This helps the blood and oxygen flow at a rapid pace to meet the demands of the body during exercise. A golf specific warm-up should include exercises that mimic movements of the golf swing. Airplane twists, golf swings and arm circles are great warm-up exercises. Many golfers experience low back pain because of the muscle imbalance in the lower body. This is especially true with the muscles of the thigh, the quadriceps and the hamstrings. Strong thigh muscles hold the body upright and can aid in correct postural alignment. Squats, back and side lunges and step-ups, with or without resistance, are all great for strengthening the legs Perform two exercises for each muscle group and complete three sets of 15 repetitions for each exercise. The golf muscles of the upper body include the latissimus dorsi, rhomboids, pectorals and triceps. These muscles are important in golf because they help create power in the swing. The stronger these muscles are, the less stress placed on the lower back. The latissimus dorsi and rhomboids are both located in the back. These two muscle groups can be worked simultaneously by performing lateral pull-downs, dumbbell rows, chin-ups and wide grip pull-ups. The pectoral muscles of the chest are worked by doing bench presses and pectoral flies. Triceps kickbacks and triceps push-ups build the muscles of the posterior arm. Perform two exercises for each muscle group three times and 15 repetitions for each set. Core training is integral to a comprehensive golf fitness injury prevention program. This is the area of the body where the majority of the golf swing occurs. The core provides the twist and torque needed to perform the swing. During this motion, the back can be under a large amount of stress, causing unwanted pain. Strengthening the muscles of the core--the lower back, abdominals, buttocks and thighs--can help golfers alleviate back pain. The plank is a great exercise for the core because it works stabilization and strength at the same time. This exercise is performed by balancing the body on the hands and feet in a push-up position and holding for 30 to 60 seconds. The stability ball is also great for core strength exercises because it requires greater flexibility and range of motion of the spine. A stability ball sit-up is an exercise any golfer can perform. Lie over the ball with the small of the back pressed against the ball and the hands behind the head. Use the abdominals to pull the upper body into a sitting position, then lower the back down over the ball. Flexibility is defined as the range of motion of a joint and its surrounding muscles during a movement. By increasing your range of motion, performance may be enhanced and the risk of injury reduced. In golf, the same side of the body is used repetitively during the backswing and the same hip is used during rotation. Flexibility exercises help correct these disparities and prevent chronic over-use injuries. Stretching the hamstrings and gluteals keeps the lower back loose. Extending the leg and placing it on a chair, while reaching for the toes, stretches the whole posterior side of the body. The gluteal stretch is performed by crossing one leg over the opposite knee and lowering into a seated position. Perform the stretches on both sides of the body.